As the UEFA Cup restarts tonight, this time next week, I shall be at Old Trafford for the second leg of the tie between Manchester United and Ajax. That will be my 5th game attended in the competition since the 2009-2010 season, at various stages. It’s sad that the competition is so maligned, as it’s enjoyable to follow. Not only that, the syndicated highlights programme on ITV4 and Channel 5 is the best football highlights programme on TV. Other broadcasters should take note. Not only that, I have a UEFA Cup branded keyring. I am so cool. So, I thought i’d share some of my photos from the last few years of the competition. That season, I went to see the Second Leg of Linfield v Randers. If you think United playing in the UEFA Cup is a culture shock, it’s the same for Linfield playing in the competition as well. Randers were 4-0 up from the first leg, but I headed down anyway, as I enjoyed the novelty of playing a home match away from Windsor Park. 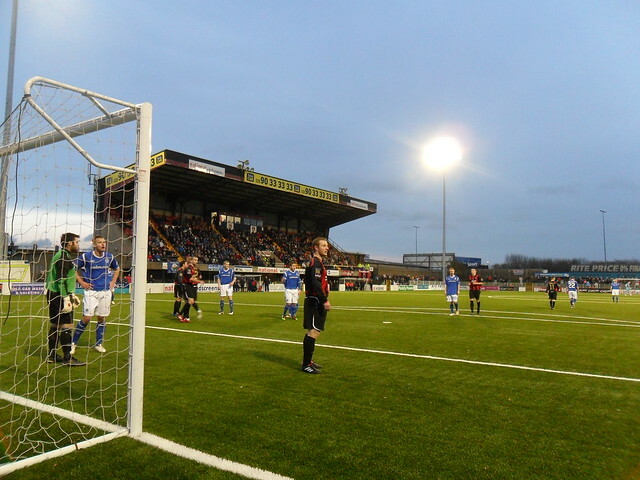 As Windsor Park’s pitch was being relaid, Linfield used Mourneview Park for their solitary home match that season. Mourneview Park is very friendly for amateur photography, so I managed to get some nice shots. The following month, I was in Edinburgh for the festival. I arrived in the city on a Thursday afternoon, and by chance, Hearts were at home to Dinamo Zagreb that evening, so I headed to Tynecastle and managed to get a ticket. Hearts were 4-0 down, but managed to pull back 2 goals to win 2-0. Was a fantastice atmosphere, and if Hearts had managed to get a 3rd soon after their 2nd. They might have been able to get the tie to Extra-Time at least. My next match in the competition was the following season in the Final in Dublin between Porto and Braga. Was a poor game, but it was great to go to a European Final. My next game came earlier this season, again at Tynecastle, as I managed to blag a ticket for Hearts v Spurs. Was a fantastic atmosphere …….. for the first five minutes until Spurs went 1-0, then were 3-0 up inside 20 minutes. After that, the match was a non-event, but still enjoyable to be at for a neutral. Hope you enjoy this photo round-up, and that I can get some more photos this evening. 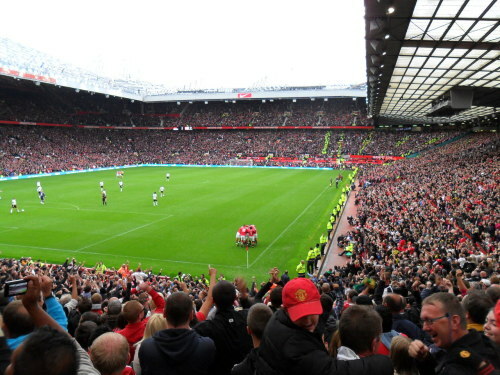 A month of travel, as I headed to the UEFA Cup Final in Dublin and went to Old Trafford to see United take on Blackpool. Absolutely loved the experience of going to a European final, even though it was the ‘second competition’ and the match itself was poor. I’d actually got good seats for the match, although the only incidents of note took place at the other end. Unfortunately, my camera was on it’s last legs by then, and I got a new one, which made it’s debut during the Man United v Blackpool game. Got an excellent seat for the game and some good photos. Also managed to get some excellent sunset shots. February was a month of travelling, and thankfully, the pictures reflect that. At the start of the month, I headed to Barcelona for a quick break, and absolutely loved it. It’s a fantastic city worth visiting, with some fantastic Street Art and sights which is a dream for amateur photography. Managed to get a ticket for the match at the Nou Camp against Atletico Madrid, where despite being in the second tier of the stand, I managed to get some fantastic shots of a fantastic stadium. Almost as soon as I got home from Barcelona, I was Dublin bound to see Northern Ireland take on Scotland, in the newly built Aviva Stadium which is kind for amateur photography, even though some of the seats have shocking views. Later in the month, I managed to see Imelda May perform at the Oh Yeah Centre for a TV show, where I managed to get into a good position for shots. Apologies for the crap headline, but it was fated against me. I’d hoped for “Newry to Nou Camp” but didn’t have any pictures from Newry on the list. For the same reason, “Ballymena to Barcelona” was canned. Hope you enjoyed my month by month round-up of the football season just past, so I just thought i’d create a shortlist of my favourites, and allow people to vote in them. I did something similar last season, and the winner was a picture of Windsor Park in the snow, while a picture of Michael Owen celebrating a goal came in second. There a no pictures of snow or Michael Owen in this compilation, so enjoy, and feel free to vote. For what it’s worth, my two main favourites are the pictures of Steven Douglas and Jim Ervin. It’s not that I have a throw-in fetish, but the composition just works. This came on the second Saturday of the Irish League season. 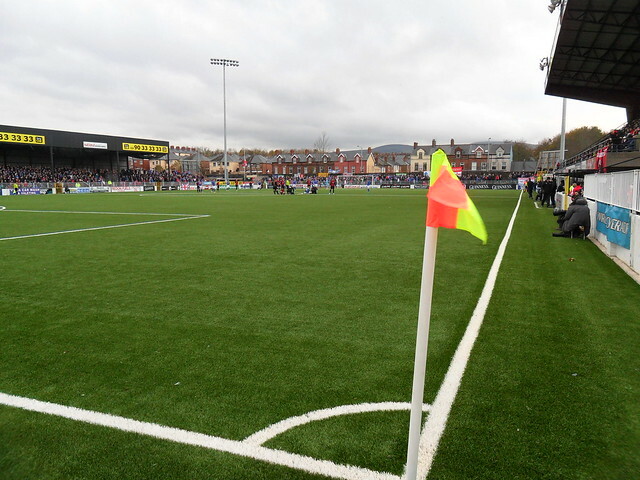 Dungannon is a ground which is friendly to amateur photographers, so I was hopeful of getting a good shot. 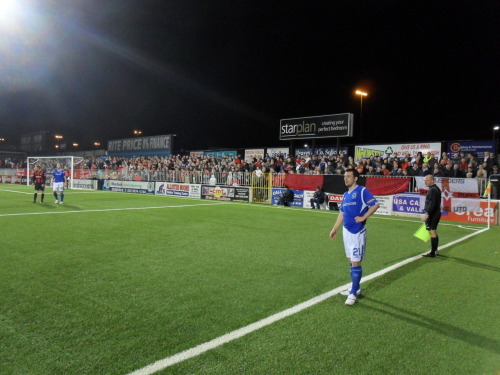 Linfield got a throw where I was based, and play was stopped as a Dungannon player required treatment for an injury. As Douglas waited, I siezed the opportunity to make the most of the framing, and this was the result. Technically speaking, it’s not the greatest photo ever taken, but it’s just the emotion of it and people’s reaction which makes my love it. Got a similar photo at Richmond Park last season, so took the opportunity during a break in play at a game at Seaview to try likewise. Again, I love the composition. Linfield, 2-1 down and chasing an equaliser, have a corner kick late on. I was quite close to the pitch and the composition just worked. It was actually a productive phototaking day for me, pity about the result. January saw me visit Solitude for the first time. At half-time, I went around these new surroundings to get photos, and saw this queue, which was composed beautifully with the fog in the background, and it just worked. Like Solitude, I visited the Nou Camp for the first time this season, and went snap happy. This was my favourite of all the portrait shots I took. A few days after Barcelona, I was in Dublin for the Northern Ireland match against Scotland. Aviva Stadium is kind to amateur photography, even if some of the views are dreadful. The only attacking action I saw in front of me was when Scotland were on the attack in the first-half, where I took the opportunity to snap Charlie Adam as he took a corner. 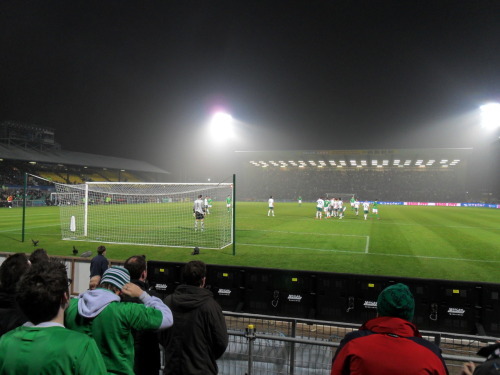 Tension builds as Northern Ireland have a free-kick against Slovenia in a Euro 2012 Qualifier. For me, the composition just works. A frustrating evening of phototaking but the right result, the opposite of my previous visit. I just love this photo of Jim Ervin. 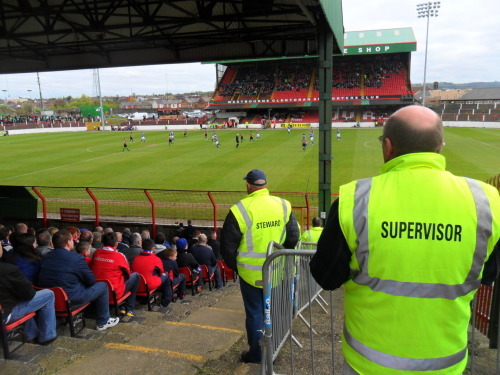 Using people as props, I managed to snap Linfield fans watching their team’s match against Glentoran at The Oval. Depressingly, it also shows the low attendance by this fixture’s standards that day. May, the month when trophies are handed out, and I got to see three, having seen the Gibson Cup presented on the last day of April. The following Saturday, I was at the Irish Cup Final, and ignored the rain as Linfield came from a goal down to beat Crusaders. The following week, I was in Dublin for my first European Final to see Porto take on Braga in the UEFA Cup Final, which I enjoyed being in the city of a European final and the atmosphere of the match, even if the actual game was very poor. My final trophy presentation of the month came when I went to Old Trafford to see United’s last match of the season, against Blackpool, and made the most of my low seats to get photos as United were presented with a record breaking 19th title. Whilst in Manchester and Dublin, I stumbled upon some ultras stickers, most notably from Schalke. If you’ve enjoyed this season’s round-up, feel free to browse the photo round-up of the 2009-2010 season. Here’s to more photos in 2011-2012. Like in December/January, I attended a match at a stadium for the first time. A lot more grand than Suffolk Road and Solitude, but Nou Camp and Aviva Stadium. In February, I also visited Estadio El Prat, home of La Liga side Espanyol. I visited Barcelona for a weekend in February and absolutely loved it. I’d booked it primarily for a break, but did keep an eye on the football fixtures, and managed to get a ticket for Barcelona v Atletico Madrid on my arrival. If I do visit Barcelona again, i’d like to do it the other way around, and go to an Espanyol match, and do the tour of the Nou Camp. 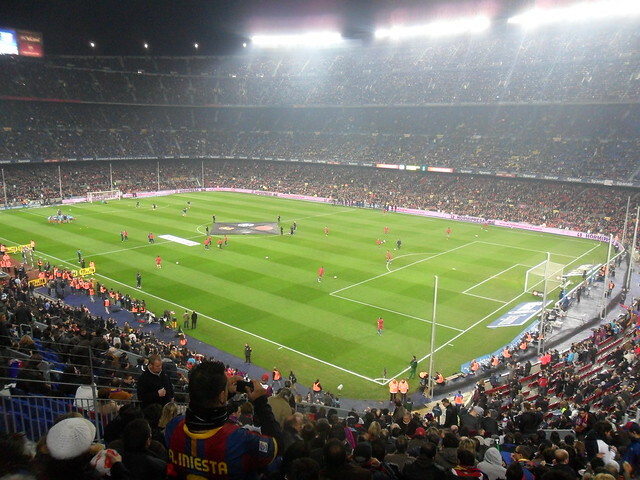 Nou Camp was great, a fantastic fixture of both modern and old features. A few days later, I visited Aviva Stadium in Dublin for the Northern Ireland v Scotland match. The match, as a 3-0 defeat suggests, was dreadful, and it didn’t help being placed in awful seats with people standing at the side of the pitch blocking your view. Thankfully, I managed to make use of some spare seats and managed to get some decent photos. Was down in Dublin last night for the UEFA Cup Final, my first ever European Final that I have seen live. At the start of the season, I booked to go down to be in the city on the day of the final, and hope to get tickets. Thankfully, I managed to get a ticket last week, meaning I didn’t have to try and source one while down there. That said, it wouldn’t have been hard to get one seeing as there were no sides from a “Major” league involved. I headed down on the Tuesday and spent a bit of time in the city. Wandered around the city on the Wednesday morning, and there was a greater number of supporters than on Tueday, and more visible. With The Queen visiting, security was tight in Dublin, and with some streets being closed off, it turned out to be a major pain in the arse when trying to explore the city. On Wednesday lunchtime, I headed to the FC Porto fanzone at The RDS, which was rather dead in atmosphere and disappointing. Made it to the stadium just before seven and was seated behind the goal to the left of the TV screen as you look. I was in that end for the Northern Ireland v Scotland game and had better seats than I did. That said, the first couple of rows in that stand are a nightmare for watching the game from due to the number of people stood at the side of the pitch blocking your view. My camera, which had already failed me twice this month, failed me again during the second-half and has since been replaced. It didn’t matter, as Porto players paraded the cup at the other end of the pitch. Managed to get some good shots of the stadium, but not much of action, mainly because there wasn’t much. Take a half day off work and spend £37 to watch a pub team. Oh joy. Was in Dublin on Wednesday night to watch Northern Ireland take on Scotland at the Aviva Stadium in Dublin in their opening match of the Carling Nations Cup. It was an impressive stadium, though you should expect all newbuild stadiums to be, but the seats I was in had a shocking view, especially with stewards blocking my view. Thankfully, there was enough space to go and sit elsewhere and take in the game. The game itself wasn’t much to write about as Northern Ireland made Scotland look like worldbeaters and never even looked like scoring. Hopefully, things improve in Serbia next month. An interesting story that grabbed my attention today, was that of the problems of the FAI in selling corporate boxes and seats at the new Aviva Stadium. I would have some sympathy if it wasn’t for Liam Brady spending so much time phoning Northern Ireland youngsters with his “Mother Ireland” monologue. Perhaps cutting down on their phone bill would be a start. When the final verdict was announced in the player eligability case, it was mentioned by some about Northern Ireland fans boycotting the forthcoming Carling Nations Cup as a form of protest to get back at the FAI. Such a suggestion might have been laughed at, but suddenly, a weakness has emerged, and Northern Ireland fans have something the FAI want, money. If you can’t sell out games against Manchester United and Argentina, then you need to have a serious look at you marketing strategy, especially, your pricing policy. For Dublin, it could easily have read Lisburn, as the Aviva Stadium, was highlighted by the pro-Maze lobby as the template for the national stadium for our utopian vision of the future. In other words, the “Keeping up with the Joneses” attitude in Northern Ireland football, where ideas get floated without thought because they have it in England/Scotland/Republic of Ireland, rather than if we actually need it. Perhaps sometimes, the grass isn’t always greener elsewhere.